Developments from Viptela and AT&T highlight growing options for cloud connections. Longtime communications consultant Gary Audin recently asked No Jitter readers, "How do you connect to the cloud?" That's a big question, given the prevailing trend toward use of the as-a-service model to replace or supplement on-premises communications and collaboration deployments. Audin lists out myriad connectivity options, with examples, and I've noted a couple myself in the post, "Cloud Communications Right to Your Doorstep." Access to the cloud -- heck, to any wide-area network -- is so often a sore spot for enterprises. Connectivity options often vary by location, as do the quality of service and reliability of those access links. The more critical the application an enterprise places in the cloud, the less willing it should be to make access to it a crapshoot. The latest company to take up this cause is Viptela (soon to be a Cisco property), bringing to bear its expertise in software-defined WAN (SD-WAN) technology. On Wednesday, Viptela formally introduced Cloud onRamp, with an eye on facilitating seamless connectivity to the cloud while optimizing the user experience. Cloud onRamp is part of Viptela's software-defined and cloud-delivered network platform, called Viptela Fabric. Viptela has distinct approaches to infrastructure- and software-as-a-service deployments. 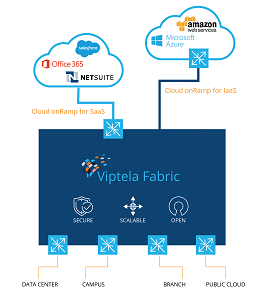 In the case of IaaS, Cloud onRamp extends Viptela Fabric from an enterprise site -- branch office or data center -- into public cloud infrastructure from Amazon Web Services and Microsoft Azure, then automatically connects to the enterprise application resident there. And, yes, that application may very well be hosted UC, which then becomes privy to all the "goodies of SD-WAN," like dynamic path optimization, segmentation, security, and compliance, said Ramesh Prabagaran, VP of product management, of Viptela, in a No Jitter briefing. On the SaaS side, Cloud onRamp uses Viptela SD-WAN routers in branches, regional colocation facilities, or data centers per usual, but digs deeper into the packets of designated SaaS apps to further optimize path selection. Salesforce and Microsoft Office 365, complete with Skype for Business Online and other communications and collaboration tools, are among about 20 SaaS applications Viptela has prepped for use with Cloud onRamp to date, Prabagaran said. Given the per-app optimization required, Viptela has started with the more popular enterprise applications and will expand its list from there based on customer demand, he added. Viptela has recorded four times improvement, on average, of the SaaS user experience at early Cloud onRamp adopters, Prabagaran said. As Audin wrote in that "How Do You Connect to the Cloud?" post I mentioned up top, one of the established options for cloud connectivity comes from carriers offering private access from an enterprise LAN to whatever cloud services they can reach. This includes offerings such as AT&T NetBond for Cloud, Verizon Secure Cloud Interconnect, and CenturyLink Cloud Connection, he wrote. AT&T this week upped its cloud connect game, announcing the addition of Oracle Network Cloud Service to its NetBond for Cloud ecosystem. The AT&T NetBond for Cloud ecosystem now comprises more than 20 members delivering secure access to more than 25 leading cloud services, the company said. Cloud access can be problematic, no doubt. And enterprises have many fixes at hand, be that specific to use of an IaaS or a SaaS application -- or both. Plain-old public Internet access doesn't seem worth the risk of suboptimal performance and a poor user experience for cloud-delivered voice, video, and collaboration applications, does it? As Prabaragan said, "If C-level voice and email doesn't work, you're going to know about it immediately!"